Here, you’ll only find materials of the highest grade. Every piece of NYME jewelry is made of ethically sourced and safe-to-wear materials, including 18k gold/rose gold, sterling silver, titanium steel, lead-free zinc alloy or brass. All of our materials meet the EU Nickel Directive standard and are absolutely healthy to wear. Similarly, you’ll only find high-grade cubic zirconia, marble, and freshwater pearls within our jewelry’s delicate details. All of our products are meticulously crafted down to the last detail. All of our pieces are made of hypoallergenic materials, meaning they are safe for even the most sensitive skin. Many are manufactured out of high-quality 18k gold / rose gold, sterling silver, or titanium steel, which will never cause an allergic reaction. For skin that is especially sensitive, we recommend these products. The rest of our items, however, are also manufactured from alloys that are 100% free of any potentially hazardous components. Particles in the air we breathe cause even precious metals to tarnish over time. To ensure your jewelry remains beautiful for years to come, we use a special electronic plating technique to create a coating that blocks the elements that cause gold or silver to tarnish. With that said, proper care is always required to ensure that your precious pieces never use their luster. 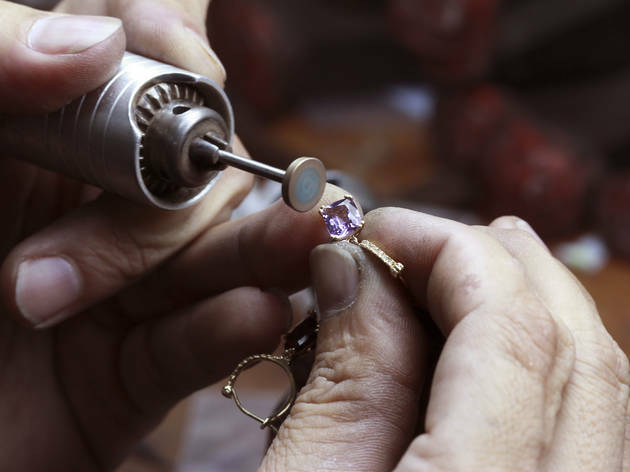 Jewelry should always be kept away from harmful chemicals, cleaning agents, beauty products, and even water. When not being worn, your pieces should be stored in a cool, dry place to discourage tarnish from forming. We recommend cleaning your jewelry with a soft cotton or microfiber cloth and polishing when necessary. With proper care, pieces made from 18k gold / rose gold, sterling silver, and titanium steel should last forever. Pieces made from a lead-free, nickel-free zinc alloy can also last an impressive amount of time when properly tended to.